COLONIE — The fourth time’s a charm — or maybe it was the swing set. After undergoing a number of modifications the Planning Board gave the idea to build two apartment buildings with a total of 18 units between Vly and New Karner roads the OK on Tuesday, March 26. Changes include eliminating all access onto Vly Road, rotating the buildings’ footprint and making the buffer between the project and neighbors more pronounced. Concept acceptance does not mean Rosetti Associates can start construction, though, and the company will need to come back before the board to get final approval. The plan for about three years has always been to build 18 units on 1.5 acres of land that abuts about four acres of land already developed with office buildings. It is, however, technically owned by two separate entities. As per town land use laws, there is no way Rosetti could build 18 units on a freestanding 1.5 acres because it surpasses allowable density regulations. By combining the two properties, the 18 units does work within current regulations as they stand. Density is formulaic, and based on raw numbers that starts with 18,000-square-foot per single family home. It varies with the type of zoning, and in this case allowances are granted because it is in an Office Residential zone that permits multi-family developments. Based on that formula, there could only be six units built on the smaller plot of land if it were to stand alone. By combining the two parcels — the larger tract is owned by Rossetti Associates and the smaller is owned by a family member — they do meet density requirements. Despite being within the legal parameters, the Planning Board sent the project back to the drawing board three times to mitigate the impact it will have on neighbors. 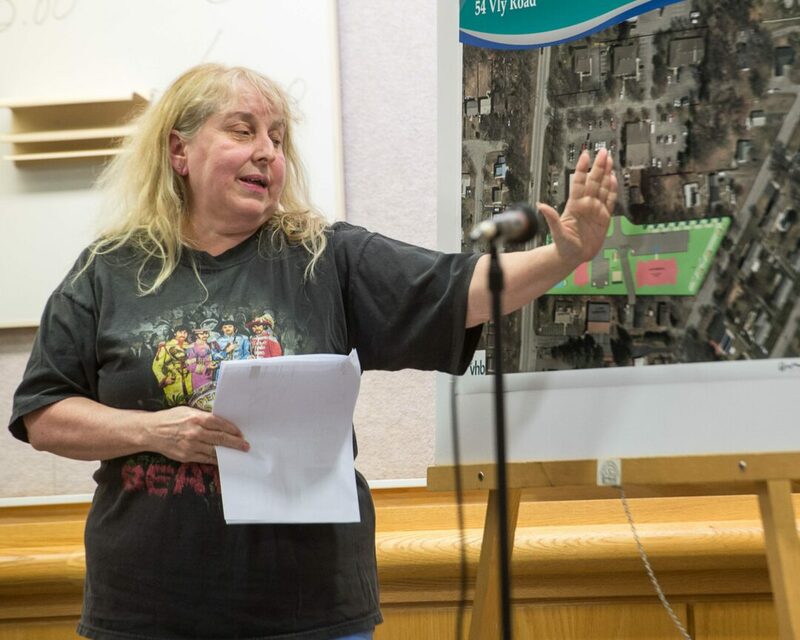 Susan Laurilliard, a member of SAVE Colonie, a Partnership for Planning, questioned what would happen if the two combined parcels are split sometime in the future. She mentioned the possibility of a deed restriction prohibiting that possibility from coming to fruition. Peter Stuto, chair of the Planning Board, said there is nothing that can prevent that from happening, and even if there were a deed restriction in place, that could be modified too. “You can come up with hypotheticals and you are really just scaring people for no reason. I’m not saying that’s your intent … ,” he said. One concession made this time around is the elimination of any access onto Vly Road. The initial incarnation had a full-access driveway onto Vly Road and neighbors were adamantly opposed to that idea. In June, 2018, the last time the project was in front of the Planning Board, the plan was to limit access onto Vly to only emergency vehicles, and only emergency personnel would have a key to open the gate that would have blocked everyday traffic. Now, the plan is to utilize an easement on the adjoining property at 52 Vly Road to allow access to 417 New Karner Road and onto the main thoroughfare. That road would be gated and only accessible by emergency personnel when needed. The main access to the new apartment buildings is off New Karner too. If the neighbors were not happy with the density, despite being within legal parameters, many neighbors were pleased to not have traffic increase on the curvy, convenient cut through between Watervliet Shaker Road and Central Avenue. The configuration of the buildings was also changed from the initial plan and now one will be parallel to New Karner Road with the front façade facing out and the second will be perpendicular to that building. Rosetti also agreed to build a berm along Vly Road and one along the property line of the residence directly to the north, which is owned by Gilda Leone, and plant trees on top of the berm to buffer the property. On top of the four-foot berm along Leon’s will also be a six-foot fence. Planning Board member Lou Mion asked about what kind of tenants Rosetti would be looking for. and if there were any amenities for children should families want to rent an apartment. Chris Falvey, of Rosetti Associates, said they would install a swing set. The eight unit building will be located on the New Karner Road side of the site and will be two stories with a footprint of 5,460-square-foot. The 10-unit will also be two stories with a 6,660-square-foot footprint. Most of the apartments will be two-bedrooms in the 1,100 to 1,200-square-foot range with a handful of 900-square-foot one-bedroom apartments. There will be 36 parking spaces. The apartment are expected to generate 10 new vehicles to the afternoon peak rush hour. The land that will house the two building is now vacant and is adjacent to office buildings that employ between 50 and 60 people. Michael Tucker, an engineer with VHB, said with the new configuration, the entire site will have 45 percent greenspace. When considered alone, the smaller tract of land will be 60-plus percent greenspace. It’s not clear when the project will be back before the Planning Board for final approval. The Planning Board said more modifications are needed and the narrative said construction could start as early as this summer.